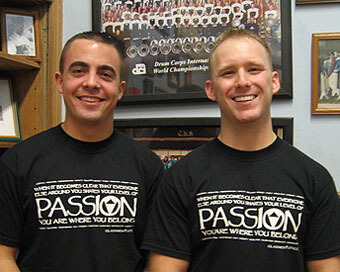 From a Glassmen press release: Matt Hensley and Bo Sodders, both from Ohio, will share the Glassmen podium in 2005, and lead the membership through an exciting year for the corps. Bo Sodders (left) and Matt Hensley. majoring in music education, and looking forward to getting a masters degree and becoming a high school band director. This will be Sodders' fourth year with the corps, and his first as drum major. "I am with Glassmen because this organization is something unlike any other organization I have been associated with. I have the opportunity to be with some of the most amazing people, staff and members, and have learned so much from being around them. I come back year after year because we have a work ethic like none other. We work hard and have fun, accomplishing things people never thought were in reach, and in the end we are a giant family, with friendships that will last a lifetime. It's great to be a Glassmen!" "For anyone that has any interest in drum corps," Sodders added, "I encourage you to reach out and grab your dreams. Drum corps is an amazing experience, whether at the Glassmen or any other drum corps, and you will never forget what you have learned. Working hard, playing music, drumming, spinning, marching in front of thousands of fans, and great tan lines ... can't ask for much more!"